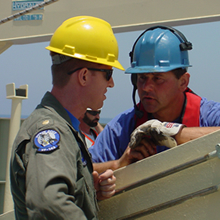 Eclipse Group is a privately held marine service provider that delivers turnkey solutions for subsea search and recovery, oil and gas support, and marine installation for both commercial and government customers worldwide. Eclipse Group will emerge to become the forefront leader in deep water technologies and applications. We will be an active and profitable organization in the deep-water offshore industry. Eclipse Group will take an increasingly active role in the field of Ocean Renewable Energy. Eclipse Group's quality mission is to provide the best value and satisfaction to our customers. We understand that to offer the highest value to our clients, Eclipse Group needs to provide dedicated customer service that emphasizes safety of personnel, assets, and the environment. Our commitment to continuous service and product improvement will be reflected in our investment in staff training, new builds, and implementation of the latest technology. Eclipse Group will ensure conformance to the highest quality standards as we implement ISO 9000 processes and procedures in parallel with our growth.